Figure 1. Map of major gas producing basins in southern Colorado. 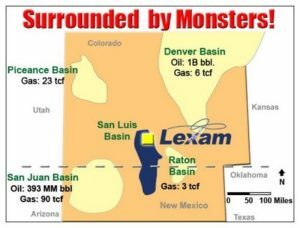 In their July, 2007 press release, Lexam states that their 3-D seismic survey confirms the presence of Cretaceous-age source and reservoir rocks for hydrocarbons (natural gas) over the entire 16,000 acre area they surveyed. They report that total prospect area is 2,180 acres in size and the two priority targets are estimated to be located 14,000 feet below the surface. 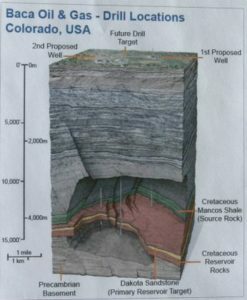 They further state that the Cretaceous-aged Dakota Sandstone is the primary target (Figure 2). Figure 2. Lexam’s cross-section of valley sediments based on 3-D seismic data. The buff-colored unit near the base of the section is designated as Dakota Sandstone (reservoir rock) and the green-colored rock above it is shown as Mancos Shale (source rock). Upper Cretaceous coalbed formations overlying the Mancos Shale are not designated in the Figure. Proposed drill locations in pristine wetlands are at the top of the section. Figure 3. Stratigraphic column of geologic formations in the San Juan Basin, showing that coalbeds in the Menefee Formation of the Mesa Verde Group overlie the Mancos Shale. Figure 4. Schematic diagram of coal-bed methane gas well and coal bed in San Juan Basin. In the San Luis Basin, the aquifer extends throughout the entire section. Although one can understand why Lexam would want to compare the San Luis Basin with adjacent basins in order to attract investors, this is not a fair comparison, geologically speaking. The San Juan, Raton, Piceance, and Denver Basins are all broad Laramide basins that formed by major crustal shortening (compression) and folding during the Laramide Orogeny about 65 to 50 million years ago. In these basins, great thicknesses of Cretaceous sediments were buried more or less intact during downwarping of the earth’s crust. By contrast, the San Luis Basin is much narrower and was formed via crustal extension, block-faulting, and rifting about 28 million years ago. Geologists believe that during Laramide times, this part of Colorado was well above sea level. Hence, Cretaceous marine sediments were probably never deposited here in any significant thicknesses. 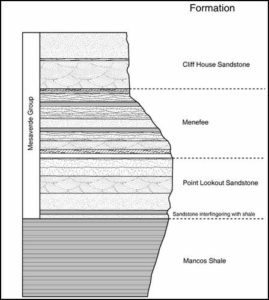 This a very important distinction because it means that Mesozoic source rocks for hydrocarbons are probably not present in commercial quantities in the San Luis Basin. BUT…. if Mesozoic rocks are present here, why not Upper Cretaceous coalbeds and coal-bed methane gas too? Water/gas separators used for conventional gas production are modified to accommodate copious amounts of “produced” water and associated coal fines (small particles of coal that can pollute water). 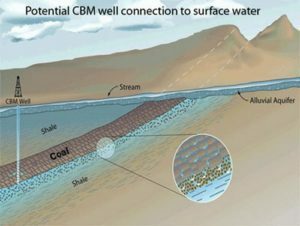 After hydrostatic pressure is reduced, methane gas is desorbed from the coal and is free to migrate through permeable strata and fractures to an area of lower pressure, ideally into well bores that created the pressure reduction. Since water must be withdrawn to reduce the pressure and allow gas migration, the volume of gas produced tends to build from a low initial rate to a maximum rate several years after the onset of production. (Conventional gas production rates are reversed, with the highest rates at the onset and a steady decline over the life of the well. When reservoir pressure drops below 150 psi, the well is no longer considered economic. It is estimated that less than 50% of the coalbed methane in place can be economically recovered by reservoir pressure depletion strategy. Thus, in areas like the San Juan Basin, enhanced production techniques have been used.